The following list of spices are extremely high in ORAC value – meaning they are very good for you and should be considered and mixed into your diet in order to take advantage of the many antioxidant and other benefits. Don’t forget the herbs, spices, and seasonings that can spice up an otherwise dull meal. I’ve added the ORAC values, which is an abbreviation for Oxygen Radical Absorbance Capacity and was developed by the National Institutes of Health in Baltimore. In short, ORAC units measure the antioxidant capacity of foods. The higher, the better. High antioxidant foods help greatly to lower the risks of cancer, degeneration, and disease. Technical: ORAC values are listed as (µmol TE/100g) (micromol Trolox Equivalent per 100 grams). Trolox equivalency is used as a benchmark for the antioxidant capacity. The actual ORAC values for a given substance will vary depending on the absolute specifics. For example, there are all sorts of chocolate – but unsweetened dark chocolate has a much higher ORAC value than other chocolates. In other words, your own ORAC research may vary somewhat depending on exactly what’s being tested, although I’m confident the numbers listed here are in the ballpark (for 100g measurements – which is one of the standard measures). Although most spices are excellent sources of antioxidants, cloves rank as the richest source of them all. The abundant health benefits of cloves have been well known for centuries. Cloves have antiseptic and germicidal properties that help fight infections, relieve digestive problems and arthritis pain. Several studies suggest that cinnamon may have a regulatory effect on blood sugar, making it especially beneficial for people with Type 2 diabetes. In some studies, cinnamon has shown an amazing ability to stop medication-resistant yeast infections. In a study published by researchers at the U.S. Department of Agriculture in Maryland, cinnamon reduced the proliferation of leukemia and lymphoma cancer cells. It has an anti-clotting effect on the blood. In a study at Copenhagen University, patients given half a teaspoon of cinnamon powder combined with one tablespoon of honey every morning before breakfast had significant relief in arthritis pain after one week and could walk without pain within one month. Oregano is known to have strong antibacterial properties, perhaps as a result of the volatile oils the herb contains which have been shown to inhibit the growth of many kinds of bacteria, including some that cause serious food borne illnesses. Researchers have even studied oregano as a treatment for the common bacteria disease known as giardia. This common amoeba is common throughout the world. Research has revealed that turmeric is a natural wonder, proving beneficial in the treatment of many different health conditions from cancer to Alzheimer’s disease. It is a natural antiseptic and antibacterial agent, useful in disinfecting cuts and burns. It is a natural liver detoxifier. It may prevent and slow the progression of Alzheimer’s disease by removing amyloyd plaque buildup in the brain. It is a potent natural anti-inflammatory. It has been shown to stop the growth of new blood vessels in tumors. Cocoa consumption is associated with decreased blood pressure, improved blood vessel health, and improvement in cholesterol levels. Flavonoid-rich cocoa consumption is also linked to reductions in risk factors for diabetes. Antioxidant benefits include a reduction in blood pressure, improved circulation, improved digestion, improved function of the endothelial cells of the circulatory system, protection from free radicals and the promotion of cardiovascular function that fights heart disease. The seeds themselves are rich in iron and are thought to help stimulate the secretion of enzymes from the pancreas which can help absorb nutrients into the system. It has also been shown to boost the power of the liver’s ability to detoxify the human body. It can help with flatulence, indigestion, diarrhea, nausea, and morning sickness. Cumin is also said to help relieve symptoms of the common cold due to it’s antiseptic properties – you’ll want to boil the seeds in a tea and then drink a couple of times a day. Researchers from Michigan State University, publishing the result of a study in the Journal of Biological Chemistry have found that this amazing natural compound is able to prevent the destructive formation of alpha-synuclein proteins that are the hallmark presentation in many neurodegenerative disease such as Parkinson’s and Alzheimer’s disease. Parsley’s volatile oils—particularly myristicin—have been shown to inhibit tumor formation in animal studies, and particularly, tumor formation in the lungs. Extracts from parsley have been used in animal studies to help increase the antioxidant capacity of the blood. Parsley is an excellent source of two vital nutrients that are also important for the prevention of many diseases: vitamin C and vitamin A (notably through its concentration of the pro-vitamin A carotenoid, beta-carotene). Parsley is a good source of folic acid, one of the most important B vitamins. Folic acid is also a critical nutrient for proper cell division and is therefore vitally important for cancer-prevention in two areas of the body that contain rapidly dividing cells—the colon, and in women, the cervix. The main use of basil medicinally is as a natural anti-inflammatory. Many naturopathic doctors prescribe basil in treatment of diabetes, respiratory disorders, allergies, impotence, and infertility. This may be because basil contains cinnamanic acid, which has been found to enhance circulation, stabilize blood sugar, and improve breathing in those with respiratory disorders. It is also know that basil is very high in antioxidants, especially when it is used as an extract or oil. These antioxidants can protect your body against free radical damage associated with aging, some skin ailments, and most forms of cancer. Studies have shown that consuming a small bar of dark chocolate everyday can reduce blood pressure in individuals with high blood pressure. Dark chocolate has also been shown to reduce LDL cholesterol (the bad cholesterol) by up to 10 percent. It stimulates endorphin production, which gives a feeling of pleasure. It contains serotonin, which acts as an anti-depressant. This information doesn’t mean that you should eat a pound of chocolate a day. Chocolate is still a high-calorie, high-fat food. Curry is a mixture of several spices, predominantly turmeric. The most prolific benefit may be its effect on those who suffer from arthritis or otherwise sore and inflamed joints. Turmeric may reduce swelling and ease the pain associated with inflammation of the joints. The compound that makes curry yellow could help fight skin cancer. Curry may help protect the aging brain. i know the list could be very long .. Thanks a lot for all your interesting information and spending time to share it with us! All the best to both of you! Let s hope we may not need what we try to prepare for! Thanks Vera for the kind words. I agree that we hope never to actually have to apply our preps because of a disaster. The good thing though is that if we ‘rotate’ some of our preps, then at least we’re putting some of them to use. Another good thing is that by prepping, it makes you more self-reliant and less dependent. It really improves your outlook too. It brings confidence. Spices used to be a *very* valuable commodity. Without modern transportation there are a lot of spices that are unobtainable. 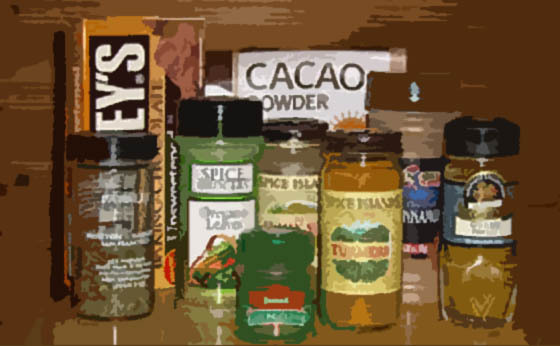 What is the shelf life of unopened spices? I’ve been stocking up on spices that would be unobtainable when transportation breaks down. That would be any spice that comes from far away places (cloves, cinnamon, mace, nutmeg, alspice)along with other spices. I buy them in bulk, place them in mylar bags, throw an O2 eater in, seal and write the name, weight and date on the bag. I’ve been using the smaller 10X14″ bags with the zip lock feature but still seal them with an iron. The O2 eaters have been 1000-2000 CC size, which guarantees very little oxygen is left in the bags. Food fatigue is one thing I want to avoid and to do that is with lots of spices. Do not skimp, it’s easier to have too much than not enough. Besides, one of those extra bags of cinnamon could be traded later. for sure, to add to this list. I have heard that cayenne in water can stop a heart attack. I may have to try that some day as I was recently diagnosed with extremely high blood pressure. I only found out because my dentist wouldn’t pull a tooth. Otherwise I would never have known, as I do not visit doctors. These three are good to help with high blood pressure by the way. I have been hospitalized SIX times (for a min. of 5 days up to 12 days) for blood clots in my leg. The valves in that leg have deteriorated completely. I am now on lifetime coumadin therapy to try to prevent future clots which could travel to a an area that could kill me (brain, heart, lungs). My doctor, and probably any ethical Dr., will not keep filling my scrips for coumadin without doing clotting-time blood tests at least every 3 months. There will be NO stocking up on this medication in case of emergency. Can’t be done. I’ve been searching for years for something I CAN stock up on to take it’s place if need be. I haven’t found any good information until now. According to this article, cinnamon should be very good for this. And a LOT of cinnamon can be stored in a very small space! This may be the single most important thing I’ve read on your site. At least for my life. Now to go do some research on dosages and usage. Having said that, we’ve definitely increased our own consumption of ‘high ORAC value’ herbs and spices. I already do grow and use most of the herbs listed here. My most favorite is parsley, I use it in everything. It grows like a weed in my garden and I like munching on a fresh handful while working out there. It also makes a great green food for livestock. I see you mention eating a lot of Parsley…I wonder if this could contribute to your frequent Blood Clots? I have seen that Parley is highly Estrogenic, and that estrogen can increase clotting. check those out for further research. Yes, I do know about Vitamin K, and have talked to a few folks on same meds as you, same concern. Try cayenne each morning to prevent those blood clots. if you need a blood thinner you can stock up on, do some research on Vitamin D. It is so pushed in the media these days, I realize it will be hard to imagine it could thin blood to excess, but it can. I had not taken it, but a couple years ago, when there was so much in news urging it, I thought, “Well, maybe I should take a little”. I tooke the minimum dose on the label. about day five, I stubbed my toe, and got a tiny, as in sharp point of glass tiny, poke on my foot. It bled so long and hard, thought it wasnt stopping. After holding firm pressure on it for many hours, it finally did. I do not bleed easily, and frankly have often cut myself, with quick stopping blood, so to speak. Was concerened what could have caused this, and research Vitamin D.
Google, Vitamin D, Rat Poison, Cholecalciferol Rat Poison. Vitamin D is put in Rat Poison to make them bleed to death. Apparently works much like Coumadin. Thank you for that tip, I do stock Vitamin D, mainly for my husband as he never goes out long enough to get the sunshine required to manufacture what he needs. I’ll see what kind of details I can find out about it. Tammy, glad you read it. No idea if it would work the same for others, but when it did that to me (tried it twice)(another family member also), I looked and looked. Only by chance did I come accross that it is in Rat Poison/why. What I can’t figure out, is , if this is fairly common, what about those folks taking thousands and thousands of units of it? Maybe there is some way you can test yourself, don’t know. I asked a ton of folks/medical, and they never heard of it. This is not medical advice, but check with your doctor about aspirin or Vitamin E. Both are supposed to be blood thinners. Also read up and try “CURA MED CURCUMIN” 750mg tablets, they work great for blood circulation and so many other disorders, they are the best !!!! So true about the vitamin E. My sister had to go to the doctor for a test, when he took a small tissue sample she bled quite a bit. He asked her what she had been taking, she told him just vitamin E, and he told her that was why. I guess it thins out the blood. Turmeric—yes, relieves pain from arthritis inflammation. Research cayenne–take it daily with tomato juice!! It has too many benefits to even list. if one had to take any blood thinners, had blood clots, maybe cayenne should be avoided? I used cayenne to stop a really bad cut on the thumb from a mandarin slicer. Instant relief and it was a steady flow of blood and took one week to heal to take off the bandage. I would recommend it as a blood clot herb. My husband takes cayenne every morning for many great benefits and also takes blood thinner. He says he feels the effects of cayenne and it is a positive. I have had good results with black pepper. Cuts that would take a long time to stop bleeding and tooth pain would be quickly put to rights after a pinch of black pepper in the wound or on the gum. An important one for this list is cayenne, dried or in powder form. It can be used if/when someone has a heart attack and doesn’t have any other meds for it; mixed with lemon juice and turmeric, it makes a great tonic for pain while working with the liver to detox; it’s capable of crossing the skin barrier much quicker than anything but an injection and yes, it’s thins the blood too. I’ve been using it for all these for over 5 years now. The key here, you can grow the plants, dry it and grind it yourself. Turmeric is really for for those who is suffering from cancer, Turmeric can kill cancer cell very fast, always take CURCUMIN extract with milk and with black paper for cancer patients upto 8000mg start with 500 mg per day three time and gradually increase the portion.